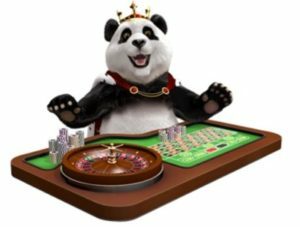 Royal Panda is a multi-platform instant play casino that only launched in 2014, and yet quickly claimed a spot alongside the upper echelon of online casinos, thanks to a stellar selection of games straight out of the gate, eye catching promotional offers and a solid reputation in customer service. The guys behind Royal Panda had a mission when they started: to create an online casino that was easy to use, never boring, didn’t follow the herd, and really cared about its players. Considering how far they have come in a short time, it’s fair to say they have probably achieved what they set out to. The cuddly panda mascot no doubt helped them along too. It’s all to play for then with a cracking line up of Slots, Table Games, Live Games and Jackpots that regularly break the £1 million mark, all hosted on a website that is extremely user friendly in terms of navigation, even if it does stagger along at times. All is easily forgiven, though, when withdrawals regularly hit your account in a matter of hours, which is sure to brighten up anyone’s day. Let’s get the negatives out of the way first, shall we? There’s no getting around it, the site is a bit on the slow side, sometimes frustratingly so. It’s not particularly graphic heavy but it does have a lot of content, namely, around 600 games total plus a Live Casino, so waiting a little longer for such a vast array of games is the compromise here. Once you are in game you won’t have any issues, and you won’t need to download anything either, its just that jumping from one tab to another can be laborious. Otherwise, Royal Panda offer a well-constructed easy to follow website that keeps things simple and cheerful. Once you have entered the Casino your game categories and a search bar are laid out plainly, with anything not relating to gameplay (Payments, News etc) tucked away neatly under the Explore tab. The regal aesthetic has a friendly tone but looks a little dusty these days; it’s nothing that a spring clean won’t fix, though, and it doesn’t detract from the gaming experience which is incredibly exciting if you use the multi-screen option – up to 4 games running at once is quite something to behold, although the sound can get overwhelming if you don’t mute some/all of them. Onto the software then, and you will find trusted developers enough to inspire confidence in even the most cynical of gamers: NetEnt, Microgaming, NextGen, Barcrest, Thunderkick – the list goes on; and not to mention good old Evolution propping up the Live Casino offerings. This mixture of quality and variety makes it almost impossible to feel short changed by what’s on offer, and leaves plenty of scope for new players and old hands to enjoy the site in equal measure. There is even, oddly, a Virtual Sports Betting section… in the Casino. Perhaps it got lost on its way to the Sportsbook. Slots – Well over 500 titles from a who’s who of top providers adorn the shelves at Royal Panda. Extra Chilli from BigTime Gaming is currently hot – in both senses of the word; or keep it classic with games like Fortune Cookie or Monkey Madness. 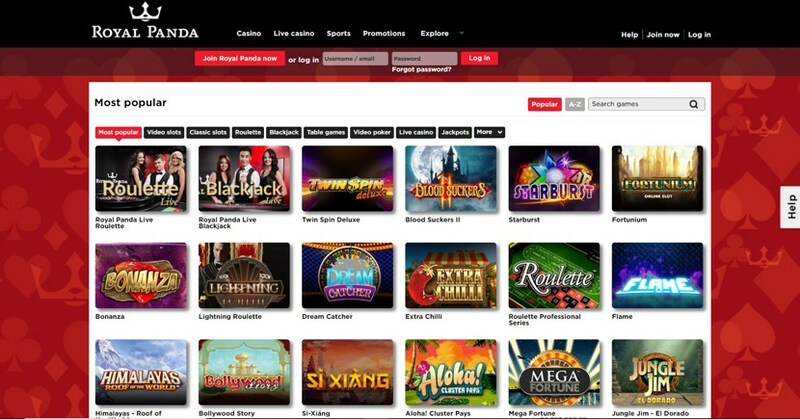 Live Casino – Enjoy a Blackjack Party or get patriotic with a few spins on London Roulette, all powered by the renowned Evolution Gaming and live streamed from a broadcast quality TV studio into your home. 24 games total. Jackpots – Life changing sums of money await with 20 Jackpots that need to be won by someone. Summon the luck o’ the Irish with Irish Riches Megaways or Slots O Gold – there are millions of pounds to be won. Table Games – Forget Brexit and play European Roulette, or go old school with Vegas Craps, just two of the 21 Table Games that are not also part of the Live Casino. Pontoon, Baccarat and Poker also available. Video Poker – All American and Aces & Faces are two of the 9 games in this section. Instant Win – Always good for a ten minute break or a quick bet while you are in the loo. James Dean offers plenty of cool, alternatively, see how you fare with Volcano Eruption – that’s not a reference to you being in the loo, by the way. While you won’t be able to download an app, the mobile optimised website is perfectly serviceable without being remarkable. It’s fairly plain in terms of style and design but it still offers hundreds of top quality games from all categories, and actually, the site is snappier on mobile too, although not a patch on some of its competitor’s mobile products. Royal Panda have kept the free play option on most games, though, which is nice to see. 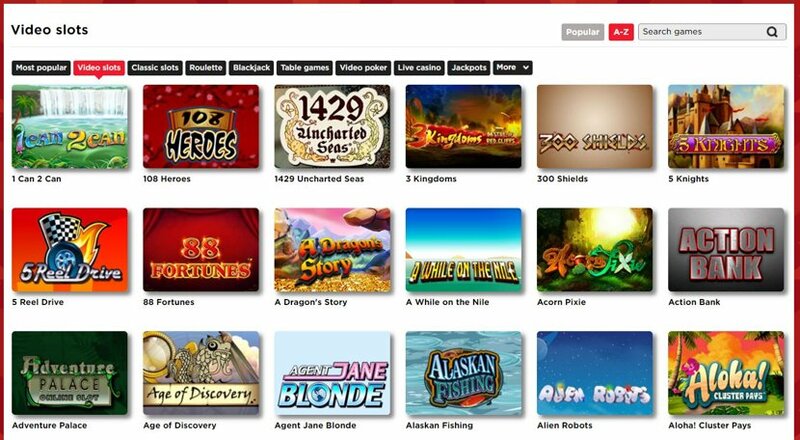 You won’t be able to search or categorise games like you can on the desktop site; instead, all the games from each category are listed underneath each other on the Casino page barring the Slots category, which you can select to View All. This does mean it’s a case of scrolling until you get to what you want since there is no search bar either, which becomes tiresome, although on the plus side all the support and banking options as well as the Live Casino have made it across. 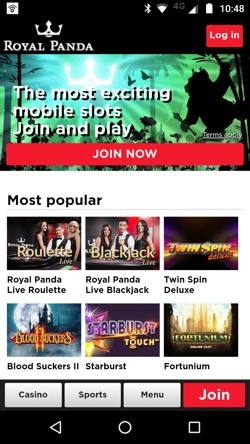 Ultimately, the mobile site is never going to win any awards, but it works as a basic reduced version of the main site and retains most of its features, so if you are a fan of the casino in general you could probably get on with it just fine. It can sometimes feel as though you need a degree to understand a Casino’s banking set up; not so with Royal Panda. Everything is laid out beautifully with every payment method explained in just the right amount of detail and all in one place. It’s interactive too, so scrolling over Skrill, for example, will give you a bit of extra info about the company – you can even start the deposit/withdrawal process directly from here. There are no fees for withdrawals, the limits seem fair and the supported banking methods are vast. In short, this is almost the perfect banking set up. We say almost because funds are still available to use until withdrawals have been processed so the temptation to bet winnings lingers, although most withdrawals are processed within a few hours even at weekends, so there’s that. For a casino that only hit the scene in 2014, Royal Panda has already covered a lot of ground. It was born out of the desire to provide a casino that really cares and goes above and beyond to provide both player satisfaction and entertainment value, and above all to be anything but generic. You could say that the sites creators – players themselves as well as industry professionals – came up with the idea to satisfy their own frustrations with the industry. It didn’t take long for players to be attracted by the exclusive and interesting promotions, the individual branding and hand-picked selection of games, and word soon got around that this was a casino that looked after it’s customers. Things continued to go well for the Malta based bookie, and a perfectly timed shirt sponsorship deal with UK football club QPR in 2017 lined up with the opening of Royal Panda’s Sportsbook. This was a shrewd move that brought them more of the right kind of attention and at the right time, which clearly didn’t go unnoticed, since only a few months later Royal Panda were acquired by LeoVegas for a reported sum of £60 million. Support is never far away thanks to the trusty Help tab, ever present at the side of the screen. Inside here is every support option available, clearly laid out and easy to understand, as well as an FAQ if you are the independent sort who likes to solve problems on your own. This is one of the best of its kind if you ask us; it even retains anything you have written should you have to minimise it and go back to the website for any reason, avoiding the frustration of having to re-enter details. The only thing that spoils it for us, is that once you start Live Chat it dominates the screen so you can’t do anything else unless you open a new browser tab. The team are brilliant. They answer queries quickly and with personality and they are very knowledgeable too – they are also active in the forums. It seems then, that Royal Panda’s claims about being a Casino that cares are well founded, and their engagement with the online gambling community as a whole is widely praised. Live Chat – Open the Help tab and there it is. Available 9am – 12.30am with super quick response times and super friendly reps.
Email – Use the contact form or email support@royalpanda.com – the result will be the same and it’s unusual to wait longer than a few hours for a reply. Phone – 0203 808 3530 will get you through to an adviser any day of the week between 9am and half past midnight. If you want to feel special, though, you can request a call back using the call back form under the Help tab. @royalpandacom – They tweet almost every day but hardly anyone engages with them; they might even appreciate it if you contacted them this way, the poor lonely souls.